Premature discontinuation of any oral anticoagulant, including ELIQUIS, increases the risk of thrombotic events. If anticoagulation with ELIQUIS is discontinued for a reason other than pathological bleeding or completion of a course of therapy, consider coverage with another anticoagulant [see Dosage and Administration (2.4), Warnings and Precautions (5.1), and Clinical Studies (14.1)]. These highlights do not include all the information needed to use ELIQUIS safely and effectively. See full prescribing information for ELIQUIS. 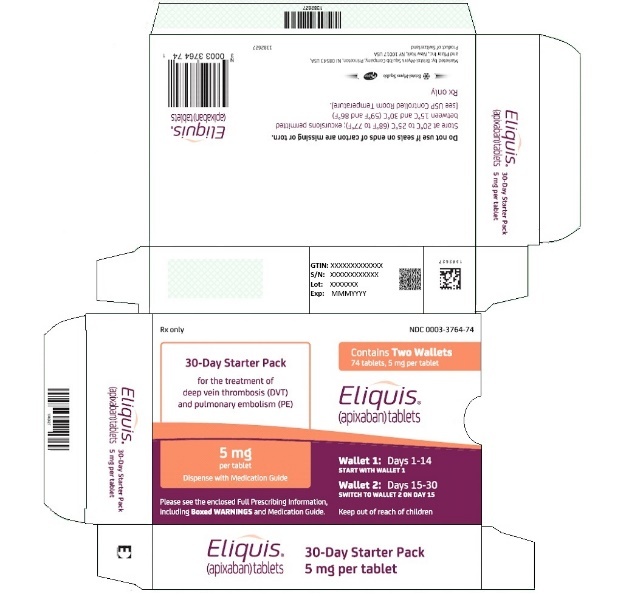 ELIQUIS should be discontinued at least 48 hours prior to elective surgery or invasive procedures with a moderate or high risk of unacceptable or clinically significant bleeding [see Warnings and Precautions (5.2)]. ELIQUIS should be discontinued at least 24 hours prior to elective surgery or invasive procedures with a low risk of bleeding or where the bleeding would be non-critical in location and easily controlled. Bridging anticoagulation during the 24 to 48 hours after stopping ELIQUIS and prior to the intervention is not generally required. ELIQUIS should be restarted after the surgical or other procedures as soon as adequate hemostasis has been established. For patients receiving ELIQUIS doses of 5 mg or 10 mg twice daily, reduce the dose by 50% when ELIQUIS is coadministered with drugs that are combined P-glycoprotein (P-gp) and strong cytochrome P450 3A4 (CYP3A4) inhibitors (e.g., ketoconazole, itraconazole, ritonavir) [see Clinical Pharmacology (12.3)]. In patients already taking 2.5 mg twice daily, avoid coadministration of ELIQUIS with combined P-gp and strong CYP3A4 inhibitors [see Drug Interactions (7.1)]. For patients who are unable to swallow whole tablets, 5 mg and 2.5 mg ELIQUIS tablets may be crushed and suspended in water, 5% dextrose in water (D5W), or apple juice, or mixed with applesauce and promptly administered orally [see Clinical Pharmacology (12.3)]. Alternatively, ELIQUIS tablets may be crushed and suspended in 60 mL of water or D5W and promptly delivered through a nasogastric tube [see Clinical Pharmacology (12.3)]. Premature discontinuation of any oral anticoagulant, including ELIQUIS, in the absence of adequate alternative anticoagulation increases the risk of thrombotic events. An increased rate of stroke was observed during the transition from ELIQUIS to warfarin in clinical trials in atrial fibrillation patients. If ELIQUIS is discontinued for a reason other than pathological bleeding or completion of a course of therapy, consider coverage with another anticoagulant [see Dosage and Administration (2.4) and Clinical Studies (14.1)]. ELIQUIS increases the risk of bleeding and can cause serious, potentially fatal, bleeding [see Dosage and Administration (2.1) and Adverse Reactions (6.1)]. Concomitant use of drugs affecting hemostasis increases the risk of bleeding. These include aspirin and other antiplatelet agents, other anticoagulants, heparin, thrombolytic agents, selective serotonin reuptake inhibitors, serotonin norepinephrine reuptake inhibitors, and nonsteroidal anti-inflammatory drugs (NSAIDs) [see Drug Interactions (7.3)]. An agent to reverse the anti-factor Xa activity of apixaban is available. The pharmacodynamic effect of ELIQUIS can be expected to persist for at least 24 hours after the last dose, i.e., for about two drug half-lives. Prothrombin complex concentrate (PCC), activated prothrombin complex concentrate or recombinant factor VIIa may be considered, but have not been evaluated in clinical studies [see Clinical Pharmacology (12.2)]. When PCCs are used, monitoring for the anticoagulation effect of apixaban using a clotting test (PT, INR, or aPTT) or anti-factor Xa (FXa) activity is not useful and is not recommended. Activated oral charcoal reduces absorption of apixaban, thereby lowering apixaban plasma concentration [see Overdosage (10)]. Hemodialysis does not appear to have a substantial impact on apixaban exposure [see Clinical Pharmacology (12.3)]. Protamine sulfate and vitamin K are not expected to affect the anticoagulant activity of apixaban. There is no experience with antifibrinolytic agents (tranexamic acid, aminocaproic acid) in individuals receiving apixaban. There is no experience with systemic hemostatics (desmopressin and aprotinin) in individuals receiving apixaban, and they are not expected to be effective as a reversal agent. The safety of ELIQUIS was evaluated in the ARISTOTLE and AVERROES studies [see Clinical Studies (14)], including 11,284 patients exposed to ELIQUIS 5 mg twice daily and 602 patients exposed to ELIQUIS 2.5 mg twice daily. The duration of ELIQUIS exposure was ≥12 months for 9375 patients and ≥24 months for 3369 patients in the two studies. In ARISTOTLE, the mean duration of exposure was 89 weeks (>15,000 patient-years). In AVERROES, the mean duration of exposure was approximately 59 weeks (>3000 patient-years). † Defined as clinically overt bleeding accompanied by one or more of the following: a decrease in hemoglobin of ≥2 g/dL, a transfusion of 2 or more units of packed red blood cells, bleeding at a critical site: intracranial, intraspinal, intraocular, pericardial, intra-articular, intramuscular with compartment syndrome, retroperitoneal or with fatal outcome. ‡ Intracranial bleed includes intracerebral, intraventricular, subdural, and subarachnoid bleeding. Any type of hemorrhagic stroke was adjudicated and counted as an intracranial major bleed. § On-treatment analysis based on the safety population, compared to ITT analysis presented in Section 14. ¶ GI bleed includes upper GI, lower GI, and rectal bleeding. † Includes 13 subjects with major bleeding events that occurred before the first dose of apixaban (administered 12 to 24 hours post-surgery). ‡ Includes 5 subjects with major bleeding events that occurred before the first dose of apixaban (administered 12 to 24 hours post-surgery). § Intracranial, intraspinal, intraocular, pericardial, an operated joint requiring re-operation or intervention, intramuscular with compartment syndrome, or retroperitoneal. Bleeding into an operated joint requiring re-operation or intervention was present in all patients with this category of bleeding. Events and event rates include one enoxaparin-treated patient in ADVANCE-1 who also had intracranial hemorrhage. Adverse reactions occurring in ≥1% of patients undergoing hip or knee replacement surgery in the 1 Phase II study and the 3 Phase III studies are listed in Table 4. Common adverse reactions (≥1%) were gingival bleeding, epistaxis, contusion, hematuria, rectal hemorrhage, hematoma, menorrhagia, and hemoptysis. The mean duration of exposure to ELIQUIS was 154 days and to enoxaparin/warfarin was 152 days in the AMPLIFY study. Adverse reactions related to bleeding occurred in 417 (15.6%) ELIQUIS-treated patients compared to 661 (24.6%) enoxaparin/warfarin-treated patients. The discontinuation rate due to bleeding events was 0.7% in the ELIQUIS-treated patients compared to 1.7% in enoxaparin/warfarin-treated patients in the AMPLIFY study. Adverse reactions occurring in ≥1% of patients in the AMPLIFY study are listed in Table 6. Adverse reactions occurring in ≥1% of patients in the AMPLIFY-EXT study are listed in Table 8. For patients receiving ELIQUIS 5 mg or 10 mg twice daily, the dose of ELIQUIS should be decreased by 50% when coadministered with drugs that are combined P-gp and strong CYP3A4 inhibitors (e.g., ketoconazole, itraconazole, ritonavir) [see Dosage and Administration (2.5) and Clinical Pharmacology (12.3)]. For patients receiving ELIQUIS at a dose of 2.5 mg twice daily, avoid coadministration with combined P-gp and strong CYP3A4 inhibitors [see Dosage and Administration (2.5) and Clinical Pharmacology (12.3)]. 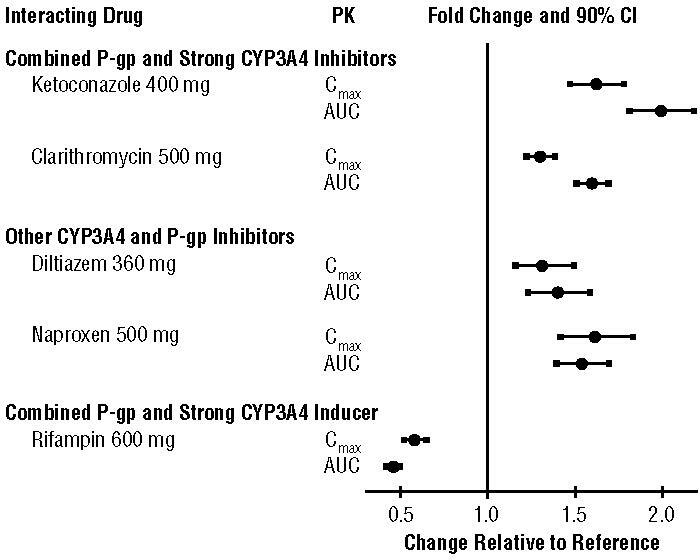 Although clarithromycin is a combined P-gp and strong CYP3A4 inhibitor, pharmacokinetic data suggest that no dose adjustment is necessary with concomitant administration with ELIQUIS [see Clinical Pharmacology (12.3)]. 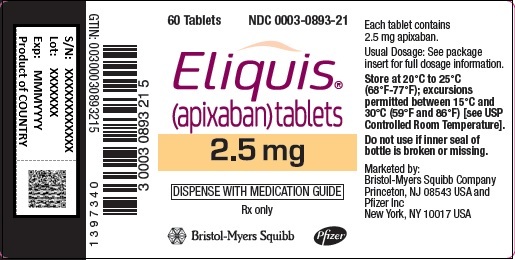 Avoid concomitant use of ELIQUIS with combined P-gp and strong CYP3A4 inducers (e.g., rifampin, carbamazepine, phenytoin, St. John’s wort) because such drugs will decrease exposure to apixaban [see Clinical Pharmacology (12.3)]. Safety and effectiveness of ELIQUIS during labor and delivery have not been studied in clinical trials. Consider the risks of bleeding and of stroke in using ELIQUIS in this setting [see Warnings and Precautions (5.2)]. 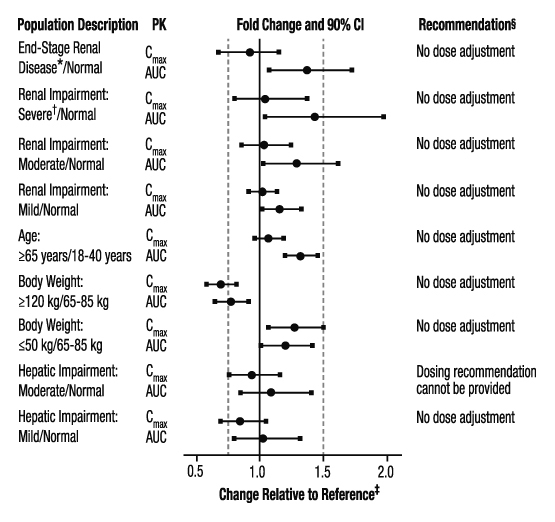 No dose adjustment is recommended for patients with renal impairment, including those with ESRD on dialysis [see Dosage and Administration (2.1)]. Clinical efficacy and safety studies with ELIQUIS did not enroll patients with ESRD on dialysis or patients with a CrCl <15 mL/min; therefore, dosing recommendations are based on pharmacokinetic and pharmacodynamic (anti-FXa activity) data in subjects with ESRD maintained on dialysis [see Clinical Pharmacology (12.3)]. Because patients with moderate hepatic impairment (Child-Pugh class B) may have intrinsic coagulation abnormalities and there is limited clinical experience with ELIQUIS in these patients, dosing recommendations cannot be provided [see Clinical Pharmacology (12.2)]. Overdose of ELIQUIS increases the risk of bleeding [see Warnings and Precautions (5.2)]. In healthy subjects, administration of activated charcoal 2 and 6 hours after ingestion of a 20-mg dose of apixaban reduced mean apixaban AUC by 50% and 27%, respectively. Thus, administration of activated charcoal may be useful in the management of apixaban overdose or accidental ingestion. 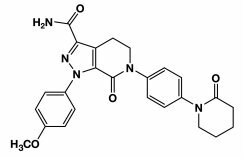 An agent to reverse the anti-factor Xa activity of apixaban is available. Effects of 4-factor PCCs on the pharmacodynamics of apixaban were studied in healthy subjects. Following administration of apixaban dosed to steady state, endogenous thrombin potential (ETP) returned to pre-apixaban levels 4 hours after the initiation of a 30-minute PCC infusion, compared to 45 hours with placebo. Mean ETP levels continued to increase and exceeded pre-apixaban levels reaching a maximum (34%-51% increase over pre-apixaban levels) at 21 hours after initiating PCC and remained elevated (21%-27% increase) at the end of the study (69 hours after initiation of PCC). The clinical relevance of this increase in ETP is unknown. Pharmacodynamic drug interaction studies with aspirin, clopidogrel, aspirin and clopidogrel, prasugrel, enoxaparin, and naproxen were conducted. No pharmacodynamic interactions were observed with aspirin, clopidogrel, or prasugrel [see Warnings and Precautions (5.2)]. A 50% to 60% increase in anti-FXa activity was observed when apixaban was coadministered with enoxaparin or naproxen. Renal impairment: Anti-FXa activity adjusted for exposure to apixaban was similar across renal function categories. Hepatic impairment: Changes in anti-FXa activity were similar in patients with mild-to-moderate hepatic impairment and healthy subjects. However, in patients with moderate hepatic impairment, there is no clear understanding of the impact of this degree of hepatic function impairment on the coagulation cascade and its relationship to efficacy and bleeding. Patients with severe hepatic impairment were not studied. The effects of coadministered drugs on the pharmacokinetics of apixaban are summarized in Figure 2 [see also Warnings and Precautions (5.2) and Drug Interactions (7)]. are following single dose of apixaban post hemodialysis. at least 2 of the following patient characteristics (age greater than or equal to 80 years, body weight less than or equal to 60 kg, or serum creatinine greater than or equal to 1.5 mg/dL) are present. Gender: A study in healthy subjects comparing the pharmacokinetics in males and females showed no meaningful difference. Race: The results across pharmacokinetic studies in normal subjects showed no differences in apixaban pharmacokinetics among White/Caucasian, Asian, and Black/African American subjects. No dose adjustment is required based on race/ethnicity. Hemodialysis in ESRD subjects: Systemic exposure to apixaban administered as a single 5 mg dose in ESRD subjects dosed immediately after the completion of a 4-hour hemodialysis session (post-dialysis) is 36% higher when compared to subjects with normal renal function (Figure 3). The systemic exposure to apixaban administered 2 hours prior to a 4-hour hemodialysis session with a dialysate flow rate of 500 mL/min and a blood flow rate in the range of 350 to 500 mL/min is 17% higher compared to those with normal renal function. The dialysis clearance of apixaban is approximately 18 mL/min. The systemic exposure of apixaban is 14% lower on dialysis when compared to not on dialysis. Carcinogenesis: Apixaban was not carcinogenic when administered to mice and rats for up to 2 years. The systemic exposures (AUCs) of unbound apixaban in male and female mice at the highest doses tested (1500 and 3000 mg/kg/day) were 9 and 20 times, respectively, the human exposure of unbound drug at the MRHD of 10 mg/day. Systemic exposures of unbound apixaban in male and female rats at the highest dose tested (600 mg/kg/day) were 2 and 4 times, respectively, the human exposure. Mutagenesis: Apixaban was neither mutagenic in the bacterial reverse mutation (Ames) assay, nor clastogenic in Chinese hamster ovary cells in vitro, in a 1-month in vivo/in vitro cytogenetics study in rat peripheral blood lymphocytes, or in a rat micronucleus study in vivo. Impairment of Fertility: Apixaban had no effect on fertility in male or female rats when given at doses up to 600 mg/kg/day, a dose resulting in exposure levels that are 3 and 4 times, respectively, the human exposure. 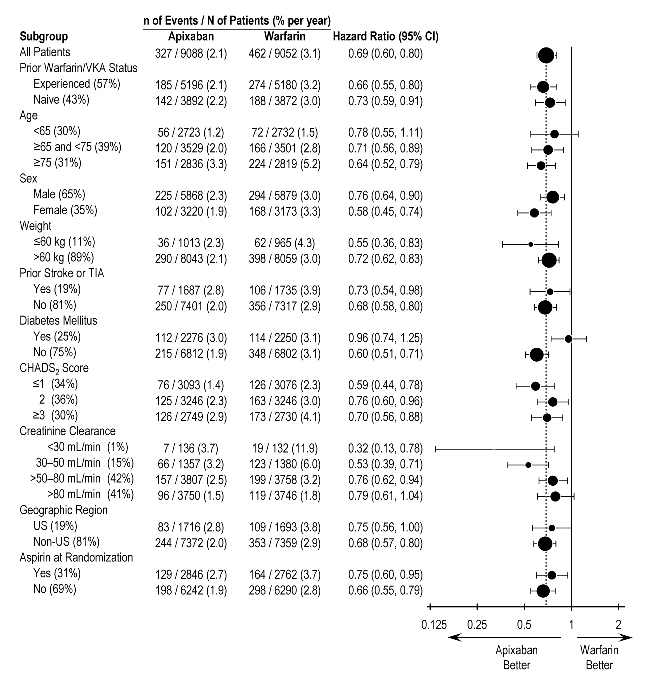 ELIQUIS also showed significantly fewer major bleeds than warfarin [see Adverse Reactions (6.1)]. At the end of the ARISTOTLE study, warfarin patients who completed the study were generally maintained on a VKA with no interruption of anticoagulation. ELIQUIS patients who completed the study were generally switched to a VKA with a 2-day period of coadministration of ELIQUIS and VKA, so that some patients may not have been adequately anticoagulated after stopping ELIQUIS until attaining a stable and therapeutic INR. 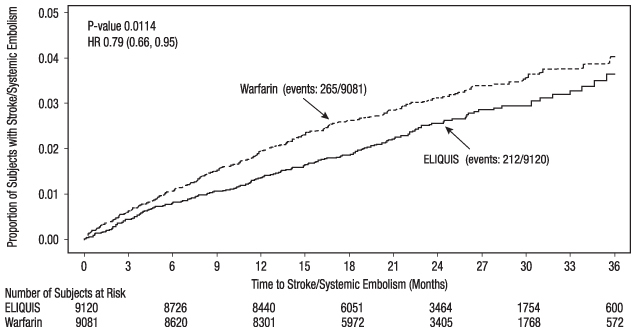 During the 30 days following the end of the study, there were 21 stroke or systemic embolism events in the 6791 patients (0.3%) in the ELIQUIS arm compared to 5 in the 6569 patients (0.1%) in the warfarin arm [see Dosage and Administration (2.4)]. 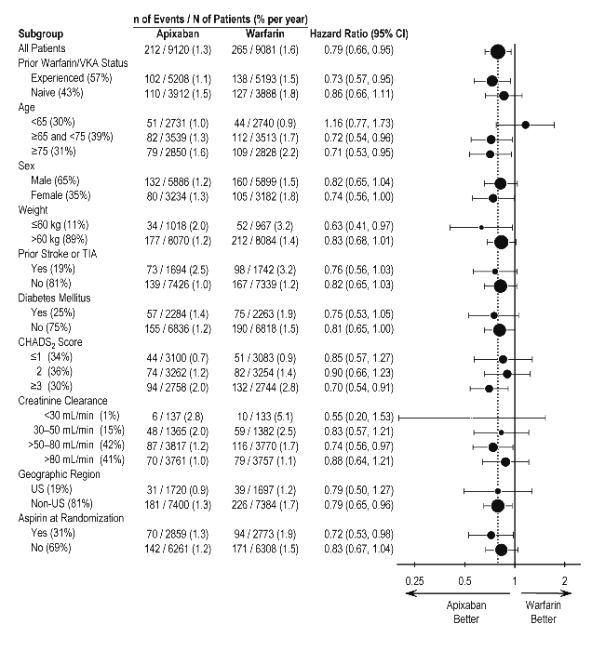 In AVERROES, patients with nonvalvular atrial fibrillation thought not to be candidates for warfarin therapy were randomized to treatment with ELIQUIS 5 mg orally twice daily (or 2.5 mg twice daily in selected patients) or aspirin 81 to 324 mg once daily. The primary objective of the study was to determine if ELIQUIS was superior to aspirin for preventing the composite outcome of stroke or systemic embolism. AVERROES was stopped early on the basis of a prespecified interim analysis showing a significant reduction in stroke and systemic embolism for ELIQUIS compared to aspirin that was associated with a modest increase in major bleeding (Table 10) [see Adverse Reactions (6.1)]. The clinical evidence for the effectiveness of ELIQUIS is derived from the ADVANCE-1, ADVANCE-2, and ADVANCE-3 clinical trials in adult patients undergoing elective hip (ADVANCE-3) or knee (ADVANCE-2 and ADVANCE-1) replacement surgery. A total of 11,659 patients were randomized in 3 double-blind, multi-national studies. Included in this total were 1866 patients age 75 or older, 1161 patients with low body weight (≤60 kg), 2528 patients with Body Mass Index ≥33 kg/m2, and 625 patients with severe or moderate renal impairment. In patients undergoing elective knee replacement surgery, ELIQUIS 2.5 mg orally twice daily was compared to enoxaparin 40 mg subcutaneously once daily (ADVANCE-2, N=3057) or enoxaparin 30 mg subcutaneously every 12 hours (ADVANCE-1, N=3195). In the ADVANCE-2 study, the first dose of ELIQUIS was given 12 to 24 hours post surgery, whereas enoxaparin was started 9 to 15 hours prior to surgery. In the ADVANCE-1 study, both ELIQUIS and enoxaparin were initiated 12 to 24 hours post surgery. Treatment duration in both ADVANCE-2 and ADVANCE-1 was 10 to 14 days. If the patient is having neuraxial anesthesia or spinal puncture, inform the patient to watch for signs and symptoms of spinal or epidural hematomas [see Warnings and Precautions (5.3)]. If any of these symptoms occur, advise the patient to seek emergent medical attention. To tell their physicians if they are pregnant or plan to become pregnant or are breastfeeding or intend to breastfeed during treatment with ELIQUIS [see Use in Specific Populations (8.1, 8.3)]. How to take ELIQUIS if they cannot swallow, or require a nasogastric tube [see Dosage and Administration (2.6)]. What to do if a dose is missed [see Dosage and Administration (2.2)]. Rotachrom® is a registered trademark of Diagnostica Stago. Tell your doctor about all the medicines you take, including prescription and over-the-counter medicines, vitamins, and herbal supplements. Some of your other medicines may affect the way ELIQUIS works. Certain medicines may increase your risk of bleeding or stroke when taken with ELIQUIS. See "What is the most important information I should know about ELIQUIS?" See " What is the most important information I should know about ELIQUIS?" See How Supplied section for a complete list of available packages of ELIQUIS.